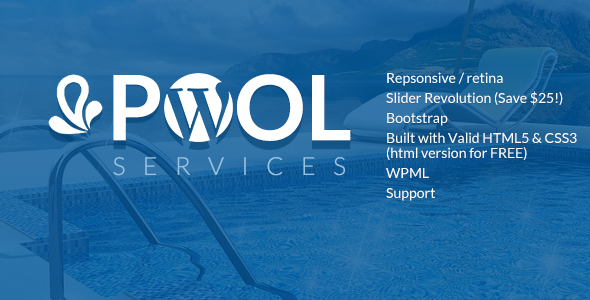 Pool â€“ Pool Service theme is a modern, clean and professional WordPress theme; it comes with a lot of useful features those will help itâ€™s user to create their website within very quick time. Pool theme is fully responsive, and it looks stunning on all types of screens and devices. Pool theme is the best choice for all pool services, pool cleaning services businesses website. If youâ€™re looking for high-quality designed theme with more extra features for your pool services businesses website, so Pool theme is the best option for you to release your website within very quick time.